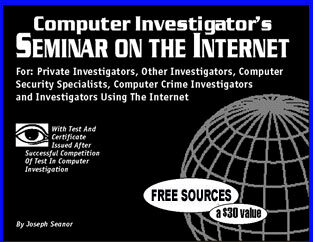 Investigators across the United States have paid hundreds of dollars in travel expenses and seminar fees to attend one of Joseph Seanor's seminars on computer investigation and the internet. This unique manual contains the same information presented at these comprehensive seminars and hands you a manual that arms you with meaty information on internet technology and computer investigation. Wire bound for easy page-flip reference while you are actually online, this manual contains information in a format that no other manual does. This unique manual will be of interest to any investigator involved with the Internet including those who use the internet as well as those interested in computer crime investigations and computer security.